Franks to the Aid of the Party is a 1950s pamphlet from Swift Premium, intended for teenagers who are planning parties for their friends. Apparently the pamphlet’s writers wanted readers to believe that there could be no better way to make friends, build your popularity and establish your social status than to serve hot dogs to your peers at every opportunity. I scheduled this booklet for August because that seemed seasonally appropriate for hot dogs. At the time I wasn’t thinking about the fact that these party recommendations are themselves seasonal, and most of those seasons are not high summer. The Valentine Dance features “Hearts-and-Arrows Sandwiches,” in which you cut hamburger buns into heart shapes and use paper and a toothpick to make the extended hot dog inside look like an arrow; side dishes include a heart-shaped red gelatin mold. The Shamrock Shindig serves up the dogs with hot potato salad. The Beach Bake looks suitable for warm temperatures, and if I lived closer to a beach where I could roast hot dogs and s’mores over an open fire I’d be raring to go. But I don’t. I wasn’t sure what to do about this one. None of the parties seemed to work for August except for the simplest, “Kitchen Party,” in which hot dogs are served up buffet-style with a selection of toppings, which hardly seemed like enough effort to qualify for the project. 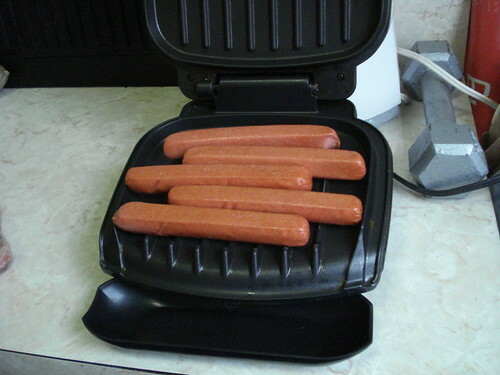 I was on the verge of swapping the booklet for something from a different month when it occurred to me that I had a bigger problem: The conceit of the book was a party, and I had serious doubts about managing to throw a party focused around hot dogs. Have I mentioned that a lot of my friends are vegetarians? Even if I decided to offer veggie dogs as well, I didn’t think I could get turnout for a hot dog party; I do have a reputation to maintain as a cook and hostess. I decided I was as unlikely to get people to come to a Halloween “Punkin Parade” with hot dogs heated in barbecue sauce as I was to get them to come in August for buffet-style toppings, and decided to do the Kitchen Party for just the two of us. This did still bring me to do things I don’t usually do; typically when we fix hot dogs we embellish with ketchup and mustard at most. Kitchen Party suggested a variety of toppings, including bacon, chili sauce, cheese, lettuce and salad dressing. 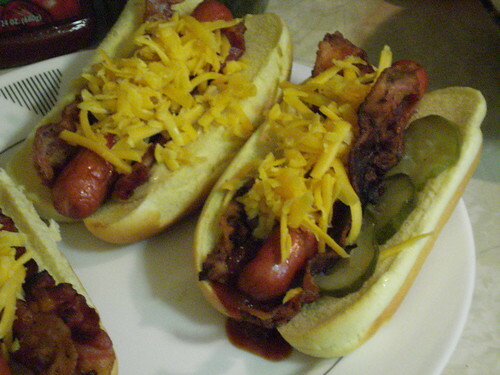 I decided that for two people we could set out a range of only things we would eat on hot dogs if we found them on a buffet elsewhere, which ruled out salad dressing; I also left out tomatoes since I had none left from my last Greenmarket trip and I won’t buy them in conventional supermarkets. 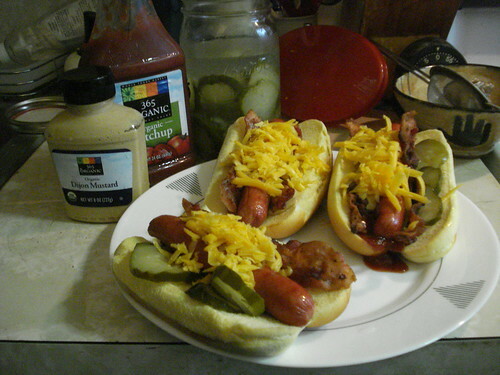 I narrowed the focus a bit more for the sake of not putting out a truly obscene amount of food for two, and thus was left with bacon, cheese, ketchup, mustard, and pickles. 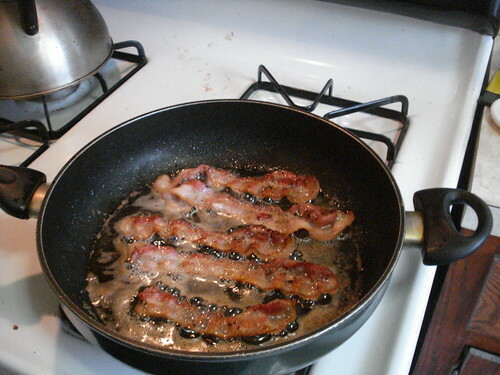 So for the second time in only a few weeks I was cooking bacon, something I hadn’t previously done for years. I admit I do eat bacon pretty often when we go for diner breakfast. I like it, but I hate to cook it; it’s messy to do and laborious to clean up after, and the smell can be overpowering. I am not fond of coming home after running errands and finding that the place still reeks of bacon. But I was in luck: This apartment is our first in, well, possibly ever that has its own window, so it was far easier to vent out the smell than in previous years. As for the cleanup, one does what one must. I’d already noticed that with an increase in cooking new dishes for the project I had sped up my use of dishwashing liquid. Such is life. Afterwards, cut some kitchen capers. Turn a chair upside down and play quoits. Lay a milk bottle on its side and invite the bravest to sit on the bottle with legs outstretched, cross legs, and eat a cookie without rolling off the bottle. Set a big, wide-mouthed jar on the floor and try dropping clothespins into it from eye level. And now’s the time to trot out all those match tricks! I am as clueless as ever about what those match tricks might be. After the Godard DVD ended we put on an episode of “Mythbusters” in which they produced a tremendous fireball using non-dairy creamer. That’s probably not what the Swift-Premium crew had in mind. Verdict: Satisfactory, but silly. I think ultimately I can’t get past the fact that I’m no longer 16, and it’s not 1957. 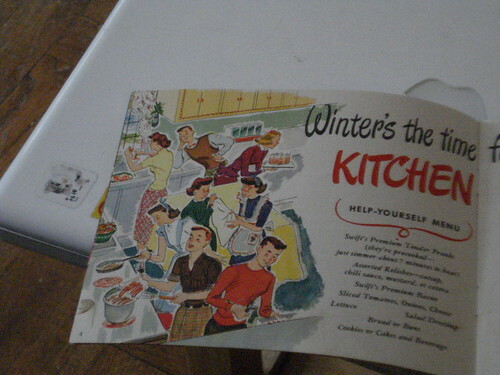 Posted in: 107 Cookbooks, Booklets and flyers, Recipes of the Damned, Vintage Cookbooks.